There is barely a soul alive who has contributed to stoner rock more than Brant Bjork. One-time drummer of Kyuss and Fu Manchu, Brant has been (quite literally) instrumental in forging the ambiance behind the desert rock scene of stoner, his contributions popping up time and again with some of the genre’s most notable names, as well as an expansive solo discography which includes purely solo releases like the seminal ‘Jalamanta’ and ‘Local Angel’, or collaborations with groups like the Bros (‘Saved By The Magic’, ‘Somera Sol’) and The Low Desert Punk Band (‘Black Flower Power’). With such an extensive back catalogue it probably shouldn’t come as a surprise that some projects and releases have remained in the vaults over his career, ‘Jacoozi’ representing material that had been originally mooted for solo release around 2010, shortly before the Kyuss! Lives reunion project took off, leaving the record gathering dust. Released almost a full decade after the tracks were first conceived, ‘Jacoozi’ stands out immediately as a record much closer to the funky, almost minimalist beats of ‘Jalamanta’ than the more rounded, full-band approach of recent records. In that, it feels like an appropriate celebration of where his solo career first took off some twenty years ago, bringing the journey full circle with a simplistic but incredibly engaging round of gentle, organic instrumentals. 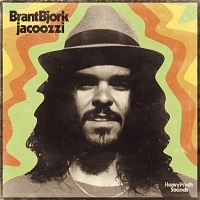 Everything about ‘Jacoozi’ feels like a distillation of why Brant has been such a notable figure in the stoner community, possessing his own groove which seems to be related to both blues and funk, whilst also instilling a sense of sedate calm in each track where the listener can almost feel the cool breeze against a scorching Californian desert. Between muted shades of jazz and funky, ‘Starsky and Hutch’ style guitars ‘Jacoozi’ takes shape much in the same way as much of Brant Bjork’s other material has, namely as a product of growing up in the 70s. Whether it was Black Sabbath worship in Kyuss or the more varied output of his solo material, the decade looms large in Brant Bjork’s discgography, Jacoozi being no exception. You can’t hear the straight-up funk groove of ‘Lost in Race’ without immediately thinking of bell-bottom jeans and questionable fashion choices, but whereas so many others who cast their eyes on the decade feel like they are trying to recapture its spirit ‘Jacoozi’ feels more a byproduct of that original spirit, an entity in its own right. Closing out on the album’s only track with vocals ‘Do You Love Your World?’ is as gentle and pure as one could hope, feeling like a second coming of ‘Local Angel’ style acoustic rock, its performance the crowning achievement of a record which is sure to become a firm fan-favourite. The back-to-basics approach is a tried and true trope of rock bands around the world, but for Brant Bjork it rings true that ‘Jacoozi’ truly is a record that takes him back to his roots. An expansive and enormously enjoyable extended jam, the album feels like a much-needed reconnection with the artist’s true artistic voice after the last couple solo records ventured closer to more generic ‘70s fare, and while Brant Bjork has never faltered in sounding like himself, ‘Jacoozi’ is a record that is absolutely unabashed in championing the instrumental/songwriting chops of the man himself. As one of the biggest architects behind desert rock, Brant Bjork is still proving himself a force to be reckoned with decades into his career, by not just expanding the boundaries of the scene but also reiterating its strongest principles to create music which spreads pure sonic joy. ‘Jacoozi’ is out now. You can get your copy HERE.